When you want a better garage, you can rely on Custom Garage Works! We have been providing a variety of custom garage services such as garage floor coating in Argyle, TX since we first started in 2003. We set out to create the perfect garage for ourselves and our growing families, but when we couldn’t find what we were searching for within the current industry, we decided to jump in ourselves. Presently speaking, we are proud to provide our clients with some of the greatest garage storage solutions on the market, as well as floor coatings that are stronger and more durable than traditional epoxy. Our team is professional trained, and we are passionate about creating custom garages, with superior garage floor coating results across DFW. 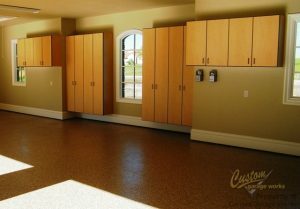 Among our most common services is the polyurea polyaspartic floor coating in Argyle, TX. This is because by using polyaspartic coatings in lieu of epoxy, we create a finish that lasts longer and is more durable. Thanks to the tough composition, our polyurea-based floor coating is resistant to yellowing and failing that can occur with epoxy. Since we choose to use a diamond grinder to prep the floor for coating, as opposed to acid etching, we can ensure a higher quality end result. To schedule your free estimate, and to learn more about our garage floor coating services, contact us at 214-494-9068 or 817-308-1305! Garage Floor Grinding Our method of diamond grinding is a more effective choice for of preparing your garage floor for coating. Epoxy Coatings Epoxy coatings are a popular form of garage coating, but they are not the best option out there! And More! 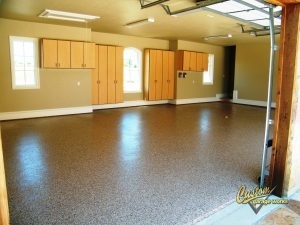 If you are looking for other garage floor options, check here to see our other services! If you are running out of space in your garage, Custom Garage Works has the right garage storage and organization solution for your home! Your garage looks best when it is clean and organized. With products such as garage cabinets and overhead storage racks, we have a variety of solutions for our clients’ garage organization needs. All of our Bulldog cabinets are secured to the wall for added safety, and our overhead storage racks are stronger and more reliable than the others you’ll find on the market. At Custom Garage Works, we are dedicated to applying the optimal garage floor coating in Argyle, TX, and designing the most efficient organization solution for our clients, and we hope to see you soon! Overhead Storage Racks Do not waste your overhead area! Our overhead storage racks help you get the most from your garage. Storage Cabinets Unlike kitchen cabinets, ours are made specifically to help you get more out of your garage space! Car Lifts Our car lifts let you store your cars with style and accessibility, and they won’t scar your new floors!